Holder says International Law Trumps The Constitution! Every now and then, news breaks in the Obama administration that is so stereotypical, it is actually depressing. You might want to sit down for this. Attorney General Eric Holder, made infamous by Operation Fast and Furious, is currently arguing before the Supreme Court that United Nations treaties trump the United States Constitution. That’s right. The sitting Attorney General, charged with upholding and defending the Constitution, is arguing before the highest court that international law is in fact the law of the land. The case in question, Bond v. United States, is actually pretty ridiculous. The defendant is charged with using a toxic substance to harass a friend who was having an affair with her husband. Under the law, this case would normally be handled at the State-level. But Federal prosecutors instead charged Bond with violating the Chemical Weapons Convention. This would be like taking a perpetrator of a domestic hate crime and instead charging him or her with genocide. Fax Congress to Stop Holder – the Constitution MUST be the Law of the Land, not International Treaties! This case is basically a complex liberal experiment to see how far they can push the boundaries regarding the enforcement of international law. An Obama administration victory in this case could have huge ramifications for other contentious issues like abortion, citizenship, and even the Second Amendment. It’s no secret that the Obama administration is looking to enact gun control by any means necessary. That means exhausting all options. The United Nations Arms Trade Treaty would provide an excellent way to limit Americans’ access to firearms without dealing with Congress. The problem is, the treaty cannot become law without the Senate ratifying it (which won’t happen). If the Supreme Court rules in Obama’s favor, the U.N. Arms Treaty could become the law of the land anyway. The funny thing is that the U.N. Arms Trade Treaty specifically prohibits the exportation of small arms to countries if there is a reasonable expectation that they would be used against civilians. If Holder wins this case and ushers in the implementation of the treaty, his involvement in Fast and Furious, leading to the death of countless Mexican civilians, would make him an international criminal. All jokes aside, Bond v. United States represents a grave risk to the sovereignty of this great country and the supremacy of the U.S. Constitution. Everyone always posits that the liberals want to replace the Constitution with U.N. law, but no one actually expected them to try to. If the Courts rule that international law is law of the land, and if the Executive branch is more than willing to implement this ruling, then only the Congress can stand against this rising tyranny. A lot of times, Congress’ power can be overstated. But the Constitution’s system of checks and balances exist for a reason. If one or two branches of government fall to tyranny, then a third branch would still remain to herald the cause of liberty. With the way the Supreme Court has been ruling lately, and Obama’s burning desire to shred the Constitution, the Congress is all that stands between state sovereignty and global governance. Unfortunately more often than not, Congressmen and Senators wouldn’t recognize creeping tyranny if it slapped them in the face. That’s where we come in. Believe it or not, we have reached a point in our history where we actually have to plead with our representatives to defend the Constitution from its domestic and foreign enemies. If the Supreme Court rules in the administration’s favor, you can say hello to universal weapons registration. You want to buy a firearm? Good luck explaining why you really need one. And good luck getting your hands on one of those imported World War II rifles you’ve had your eye on. Most of the time, slippery slope arguments are overblown. But there’s no exaggeration to this. 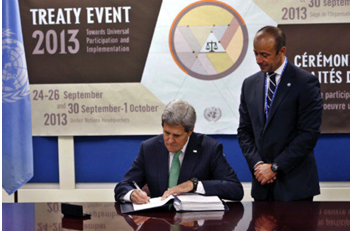 Even when the Senate refused to ratify the U.N. Arms Treaty, Obama had Secretary of State John Kerry sign it anyway. Talk about defiance! The only thing that stands between Kerry’s signature and Obama’s gun control agenda is that pesky piece of parchment called the Constitution. And if the Supreme Court rules in Obama’s favor, you can kiss the Bill of Rights goodbye. If you value your second amendment rights, or any of your rights for that matter, stand and fight. Urge Congress to honor its oath and reject Obama’s globalist ambitions. Conervative Daily is a media outlet protected by the First Amendment and support for our efforts is not tax-deductible. Shuffling Madness Media, P.O. Box 1382, Parker, CO 80134 Copyright 2013 Shuffling Madness Media. All rights reserved. This entry was posted on Tuesday, February 25th, 2014 at 9:19 AM and is filed under World Politics. You can follow any responses to this entry through the RSS 2.0 feed. Both comments and pings are currently closed.